Lack of fire is a major ecological threat to prairies. Many native species, including Echinacea, seem to respond positively to burning. Burns appear to stimulate flowering. But do burns promote reproductive success in Echinacea? We are investigating the extent to which fires reduce spatial isolation and increase flowering synchrony of individual plants in the season after a fire. Do fires promote greater mating opportunity and fecundity of individuals? 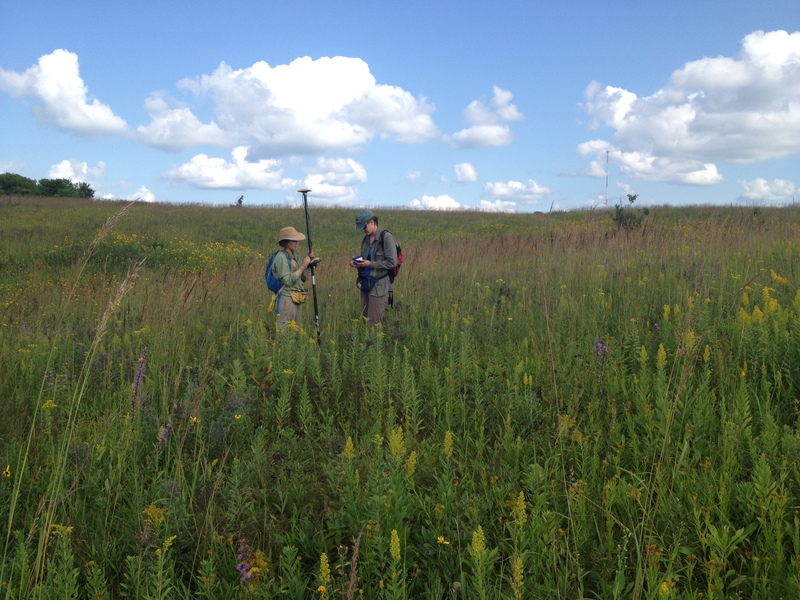 Although he didn’t know it then, Stuart began studying the relationship of Echinacea population dynamics with fire in 1996 at the Staffanson Prairie Preserve, a 40 ha area of remnant prairie owned by the Nature Conservancy. The preserve is divided into east and west management units, only one of which is burned in any year. Stuart defined a transect that spans both management units and contains over 300 individual plants. Each year in the transect Team Echinacea keeps track of demographic data (which plants are flowering and how many heads they have), flowering phenology, and style persistence, which indicates a style has not been successfully pollinated. In some years, a sample of heads is harvested and we assess the number of achenes and seed set. Products: One manuscript in progress. Stuart made a presentation on this topic at the ESA annual meeting in 2008. Jared made a presentation on this topic at the ESA annual meeting in 2015. Link to flog posts: Read updates about this experiment on the flog.